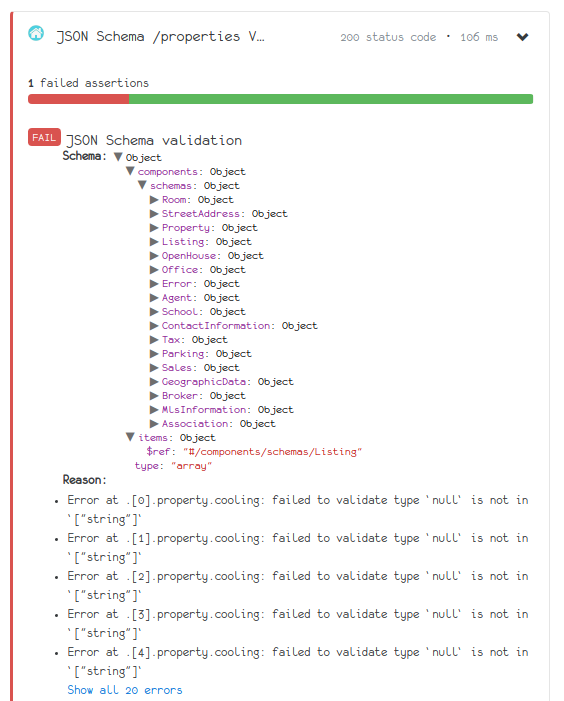 Automatically import JSON Schema assertions from your OpenAPI V3 documents, a new free JSON Schema validation API, and support for OpenAPI nullable. Automatically import JSON Schema assertions from OpenAPI V3 Responses. definition that contains Response schemas. If you're familiar with OpenAPI or Swagger, you may be aware that the OpenAPI Schema definition is an extended subset of JSON Schema. The OpenAPI spec defines several fields that are specific to OpenAPI's JSON Schema subset. The field we wanted to tackle up-front was nullable which specifies whether a field in an API response can by null (as opposed to omitting it). Assertible handles several nullable field variants by default, and Assertible handles the most common use-cases. See our OpenAPI JSON Schema compatibility docs for the specific transformations applied to your JSON Schema assertions. If you have any OpenAPI JSON Schema compatibility issues you would like Assertible to address, please open our chat box or send a feature request email to admin at assertible dot com. Feel free to use this API for validation, testing, and experimentation purposes. It's completely free and does not require an Assertible account to access it.